No additional multibeam survey was conducted this season, instead the many anomalies generated over the years were addressed. Although the number of anomalies varies as new criteria and reviews are made, the number of unverified anomalies is substantial. In addition to anomaly investigation, efforts to largely complete the investigation of the Levanzo I wrecksite were undertaken. This site, discovered in 2006, has been mapped with various video/still camera combinations over the subsequent years and including the 2009 season. A small sample of artifacts were collected during the 2006 season, but nothing has been taken from the site until this season. The reason for waiting until this season was attaining the proper equipment, software, and developing the appropriate methodologies to properly map and test excavate the site. During the anomaly verification and area searches, various random finds were located. Notable finds between 2006-8 were upper portions of Greco-Italic amphoras. During the 2009 fieldseason an intact Greco-Italic amphora was located. As these Greco-Italic amphoras were common, several examples were collected for analysis. Each of the amphora fragments and intact amphora collected were of the same type, and their similar dimensions along with matching asymmetry of their handles indicate that these amphoras were probably produced at or near the same time and are possibly from the same kiln location. A concentration of these amphoras were in the NW section of the survey area at the edge of a rocky topography, and just to the N of the Catherine D ram find location. 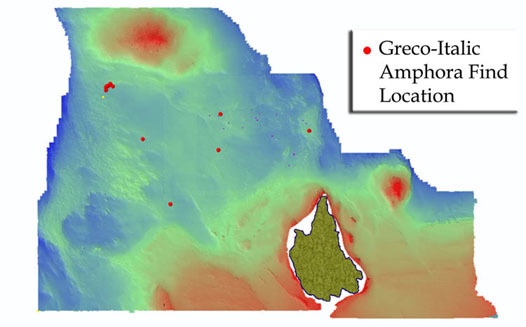 Their distinct similarities, concentration in the survey area, and location where drag-net runs would end may indicate a 4th-century BCE wreck waiting to be discovered. Conversely, if there had been a wreck carrying these Greco-Italic amphoras deposited in the central portion of the survey area, the strewn finds of amphoras and amphora fragments may be all that remains of the site due to net dragging. One of the clearer anomalies in the eastern section of the survey area where the rocky topography is less prolific was a relatively modern wrecksite. The only visible cargo remaining on this site is a large amount of raw sulfur ore. This site lie in c. 50 m of water and it was therefore possible to deploy divers as well as the ROV on the site. Some wood from the vessel was visible on the surface, possibly ceiling planking, and there were several unidentified iron objects. The condition of the wood and the degree of encrustation, as well as form, of the iron objects indicate a relatively modern date for the site. All of the sulfur cargo was in fist to head-sized chunks; many were rough hewn but others appear to have regular edges associated with their being quarried. A chunk was raised for analysis and a sample was taken for analysis by the Superintendant’s Office. 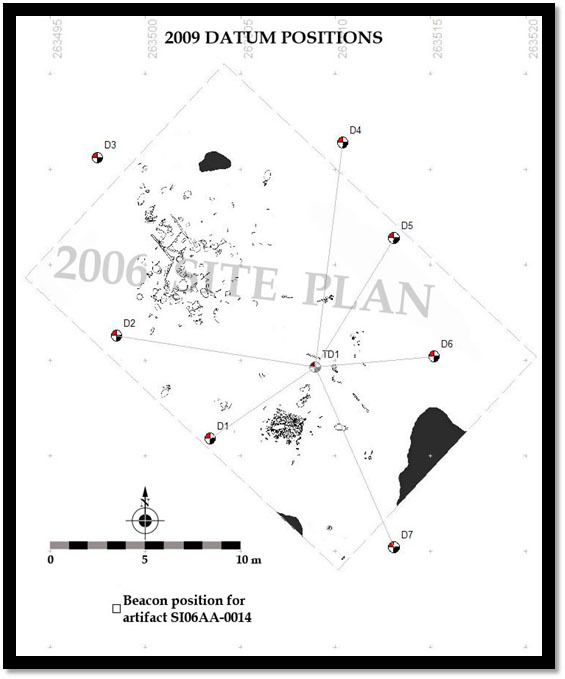 In planning since the 2006 fieldseason, the project proceeded to experiment with mapping, recovery, and excavation methods on the Levanzo I wrecksite in the 2009 fieldseason. Several factors make the Levanzo I site ideal for experimentation with the mapping and excavation of sites via a ROV. It is clear based on the history of fishing in this area N of Levanzo island and the observed damage by drag nets that the Levanzo I wrecksite has been severely impacted. It is clear that the majority of this site was removed years ago by drag-nets, possibly as much as 90% or more of the original deposit. Subsequent years of recording has also demonstrated the movement of artifacts through biogenic modification. A reason why biogenic modification has a great impact on this site, and why this site is favorable, is its shallow depth into the sediment. Although only hypothesized prior to 2009, the majority of the remaining material appears to sit on, or just under, the surface. Hence, it is both more easily disturbed by aquatic life and the ‘z’ factor in mapping is much easier to control. This season we enacted the plan and gathered much data about the site, as well as learning a great deal about how to perform such work on a site with an ROV. Given the high degree of site disturbance from drag-net incursions and biogenic modification, it is unlikely that the current positions of many of the artifacts are congruent with their original depositional locations. A notable exception is the artifacts within the square-shaped deposit on the SE portion of the site, as it has maintained its un-natural overall shape. Although artifacts have undoubtedly been moved around within this deposit, and out of it, those remaining are likely near their depositional location. Although largely disturbed, it was decided to make every effort in designing and implementing a methodology to control and record the provenience of artifacts. As such, the primary goal was to conduct thorough and accurate site mapping. The overall stratagem was to control x and y because of their greater scale and importance on a site that is primarily comprised of surface finds. Given the tools available, the initial step was to place datums constructed of 10-cm diameter pvc pipe encased in a block cement around the site in order to provide reference points for measuring. Each of these datums was 1 m in total height. It was envisioned from the beginning that one of the methods for determining the positions of the datums, and thus objects on the site, was to measure in the datums relative to one another utilizing Site Recorder software. Two methods were available for measuring the datums’ positions on the site: absolute and inter-datum measurements. Absolute positions were obtained by placing a beacon on each of the datums. Inherent in the design of the datums was the open-ended pipe; this opening allowed a beacon fitted with a hook to be attached at their top with the ROV. The beacon position was then received and processed on board the Hercules. In Fledermaus software, the position was displayed upon the surface model of the seafloor. These beacon positions not only provided an excellent record of their locations on the site, but also provided real-world location and orientation for the wrecksite. The other method for ascertaining beacon positions, inter-beacon measurements, was accomplished through a new sonar fitted to the ROV. 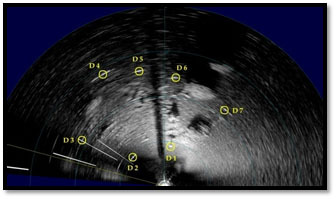 This high-frequency sonar clearly images small objects including the datums for the entire site; a 180o sweep was used to capture as much of the site as possible. Through this sonar’s software, the precision of a measurement’s readings is to the millimeter. Additionally, sonar sweeps can be recorded in the software, which allows a variety of measurements to be taken after ROV deployment. In order to obtain the most accurate measurements, the ROV was placed in three different positions around the site in order to obtain various vantage points. 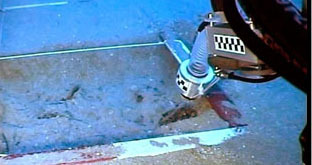 Furthermore, during any subsequent measurement recordings made for temporary datums, or when the ROV was at rest on the periphery of the site, a recording was made in order to make additional measurements. As a final experiment in the ongoing assessment of the Levanzo I wrecksite, two small test excavations were conducted. A 1-m square (interior edges) was constructed from flat aluminum and painted red/white in 25-cm increments. Bolts were attached through the four corners in order to resist the square shifting after placement on the site. Once deployed to the site, it was placed locations largely free of surface artifacts as this was the first trials in excavation methods. Once set in place on the seafloor, a flyover was conducted so and its relative position recorded with video. 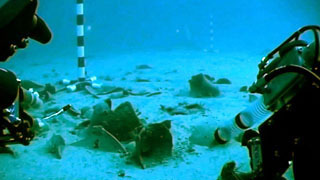 Additionally, temporary datums were placed on two opposing corners; their positions were recorded with the sonar and measured in relation to the seven permanent datums with the sonar software. These squares (above) allowed the precise recording of all artifacts discovered during excavation. Based on the method commonly utilized when recording sites during dive operations, the square was segmented into four quadrants, A – D, and each quadrant further subdivided into four quadrants, 1-4. Hence, during excavation the notations made record artifact positions based on this quadrant system; these positions are designated by the square (ex. SQ1) and followed by the quadrant location (ex. A4). 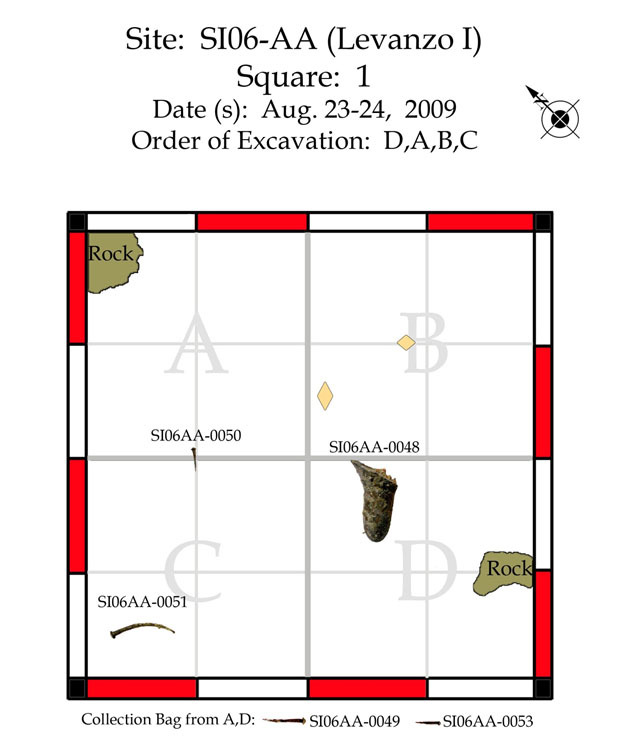 In this example, the location of the artifact is thus recorded as: SQ1-A4. The depths of sediment layers and artifacts were ascertained with scales held in the ROV manipulator arm or by those affixed to the dredge. As noted the majority of all cultural material on the site lies on the surface or just beneath. All of the larger intact, nearly intact, or large fragments of amphoras and tableware are entirely, or almost entirely, exposed on the surface. Artifacts were selected based on their completeness or partials if the rim, neck, and handles (RNH) were intact. For the recovery of these larger artifacts, the ROV’s manipulator arms were ideal. In some instances, a special large claw for the manipulator allowed amphoras to be grasped around their mid-sections and carried without pressure on their handles. During field operations this season, 13 amphora examples were recovered (8 wholly or mostly intact and 5 upper portions) for analysis. The majority of these were amphoras noted in the imagery from other seasons, which necessitated recovery for a more confident identification. Direct analysis confirmed the general assessments, for the most part, of the amphoras in that the primary mix is mostly N. African (Africa), and most likely Tunisia, in origin with a secondary presence of cargo from Portugal (Lusitania). A lesser representation originates from the East Mediterranean/Black Sea. All examples have an overlapping date in the 4th century CE; however, the little is known of the Troesmis XIII type and its extension into the 4th century CE may be a contribution of this site.The general assemblage is consistent with that one would imagine working the main trunk routes of the annona trade, particularly that between Carthage and Rome. The presence of amphoras from Portugal and further east speak to the importance and magnitude of Carthage as an entrepôt. The absence of amphora material from the central portion of the wrecksite, confirmed in the test excavations, substantiates the theory that this vessel was carrying grain as part of its cargo. Grain would have been a common item on board, along with the oil and fish products indicated by the amphoras. The interesting aspect for study within this assemblage are the Riley 1B amphoras that thus far have an uncertain production area. With this vessel hailing from Tunisia and a high representation of this type in the remaining cargo, these finds may support arguments for a N. African origin. A further analysis of each type, their distribution on the site, and where these fit into the original cargo will be addressed in the publication of the site. Tableware was a common find on the site, and from all areas of the site. During the 2009 fieldseason five additional pieces were recovered, four were flagons and one uncertain. A total of five flagons have been recovered from the site. The variety, distribution on the site, and representative amount indicate this was part of the cargo; moreover, the presence of five flagons is a highly unlikely component of shipboard galley items. Coarsware from N. Africa was a common export item, particularly to Hispania, but was also shipped into Central Mediterranean ports. Such items were commonly tertiary goods associated with government shipments and loaded onboard with state cargos by captains endeavoring to make additional earnings. As with the 2006 finds, the latest tableware will be formally typed and parallels drawn in the work on the site publication. Seven tubi fittili were recovered during the 2009 fieldseason, bringing the total to 11 examples recovered from the wrecksite. Six of the seven recovered this season were contained within amphoras; this enabled the attempts to recover individual examples largely unnecessary. Although the examples recovered in 2006 were from the square-shaped deposit on the SE portion of the site where a concentration exists, as were three of those from 29009, three were from the northern sector of the site and another was found at mid-site. However, the three from the northern sector found within an amphora. All those within amphoras were surely dragged into them by octopi; hence their original provenience is unknown.An examination of basic dimensions of the tubi points to several lines of interesting research for the final publication. With the sample now assembled, statistical generalizations are attainable for their basic sizes and proportions. The tubi are somewhat consistent in most of their basic dimensions, but differ to an adequate degree that demonstrates their being crudely made items. Moreover, it may be argued that close standardization of their dimensions was not requisite for their functionality. Noting the significant number, and concentration, of tubi on the site, the lines of inquiry into secondary/tertiary cargos are further possible. Each of the three small glass fragments collected during the 2009 fieldseason were found within a recovered amphora, doubtless the result of octopi. At least two of the fragments represent two different vessels: possibly a square bottle and a plate. All fragments were clear (presumably colored with manganese oxide) and appear to be mold blown. Such glass is consistent with the 4th century date of the wreck. The presence of this glass underscores the presence of secondary items shipped along with annona cargos. It is possible that glass fragments may be widely present on the site. The few fragments encountered thus far is due to the limited excavation conducted thus far, and that this excavation was conducted in the central portion of the site. 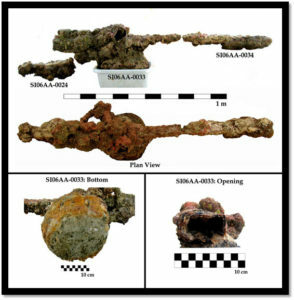 Ship’s fasteners were also a common find, with a total of 10 collected during collection and excavation of the site. Their find locations include the central and SE portions of the site. 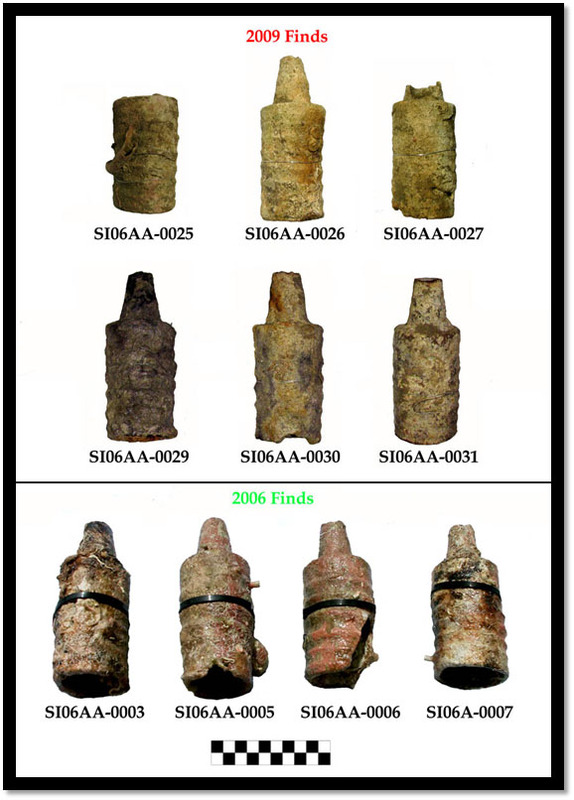 Each of these fasteners were nails, and 6 of the 10 were found within amphoras. Undoubtedly chunks of wood were pulled in by octopi with nails inside and rotted to leave the nails behind. The largest nail was found during excavation where it rested atop the mud layer at the bottom of the soft sand cover in Square 1, not far from a smaller nail. 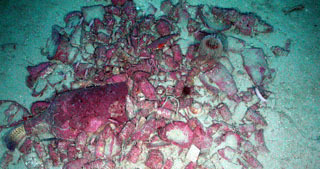 The two other nails from Square 1 were found within the mesh bag after the ROV returned to the ship; only the upper, sandy layer was removed in this initial excavation and thus both nails were contained within this strata. All nails were square in cross-section and possessed a blue-green color where the black patina was missing that indicates they were made of a probable copper, or copper alloy, material. Each nail was complete except for SI06AA-0045, and SI06AA-0046 has a small portion of its tip missing. Furthermore, each of the nails’ heads were rounded squares from a top view, and appear to be bent downwards towards the shaft. As a result, there is a square-shaped, flat crown on the heads. Note that there is little consistency in the length of the nails, ranging from 2.7-14.5, yet more consistency in their shaft widths. 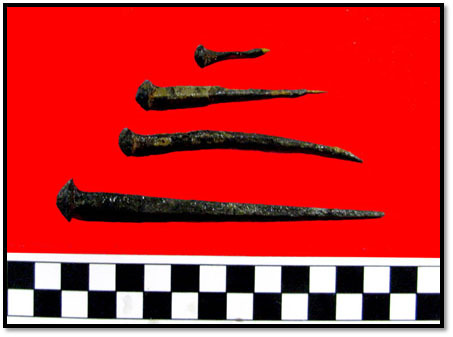 It is of this researcher’s opinion that these nails were used in the construction of the vessel, with those found in Square 1 marking the position of former hull remains. If the cargo at the center of the vessel was indeed grain, the timbers here were exposed to a greater degree and sooner, and as a result would have been eaten away. The result would be as noted in the excavation, the remnants of nails that have settled in the sandy layer. Some assessment in the presence of timbers can be made after the work conducted this season. Based on the photo mosaic, if these were beams, they were circa 10 cm molded dimension and approximately 1 meter apart. Their height on the site, dimension, and relative spacing suggests stringers. In addition to these likely timbers at the NW sector of the site, a small section of wood was located during excavation in Square 2. This wood was lying atop the hard muddy layer and within the loose sandy layer and was oriented perpendicular to the parallel possible timbers at the NW sector of the site; thus, it is in an orientation consistent with a framing timber. Its circa 5 x 7 cm dimensions are also consistent with a framing timber. The large concretion at the central-north portion of the wrecksite was collected. At least two iron bars, square in cross section, comprise the linear part of the concretion, with a large ball attached about midway along its length. The most horizontally linear bar appears nearly intact, whereas another bar crossing this one appears to have lost part of its length that would have extended upwards. There appears to be wood included within this concretion, particularly the majority of concretion SI06AA-0024. A nail hole (0.7 square) and a large bolt head (2.5 high, 3.2 diameter) in the upper portion of this concretion confirms the presence of a large timber. This nail hole is consistent in shape and dimension to those nails found on the site. 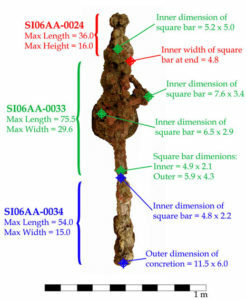 Furthermore, the orientation concretion SI06AA-0024 is generally perpendicular to the two parallel timber-like objects in the NW of the site and also generally in line with the timber uncovered in Square 2 D-4. As this timber was completely buried, it was low in the hull and probably a framing timber that was encased by the concretion of the iron object lying atop it.That it is slightly askew of perpendicular/parallel with the other timbers noted is likely due to its having fell from higher in the hull and/or movement due to drag nets. Without an analysis of this concretion completed, it is almost impossible to determine what the object may have been that created it. However, there are parallels from other Roman-era discoveries that may assist in guiding the conservation and analysis. 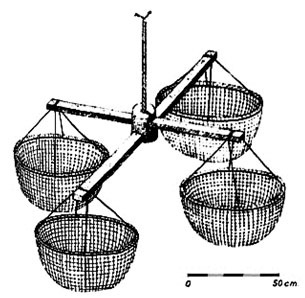 Fish traps made of crossed Iron bars and chain could produce this deposit, such as the one from the Cassidaigne deposit (Benoit 1962, p. 12, Fig. 43-44; found in the mouth of Rhone that contained material from 3rd BCE-5th CE), an image of which is provided here. The basic dimensions of the trap and its configuration are similar to the combined concretion recovered. If this were a version of the fish trap, the baskets on the Levanzo wreck may have been nested, the chain wrapped with them, and placed with the two iron cross bars for storage. The baskets themselves were likely made from cord and have since rotted away, leaving the ball of chain in a concreted mass. Likewise, this may be ships equipment or a part of the cargo consignment. An x-ray or other examination of this concretion should allow the definition of an object that will provide interesting insights into this wreck. 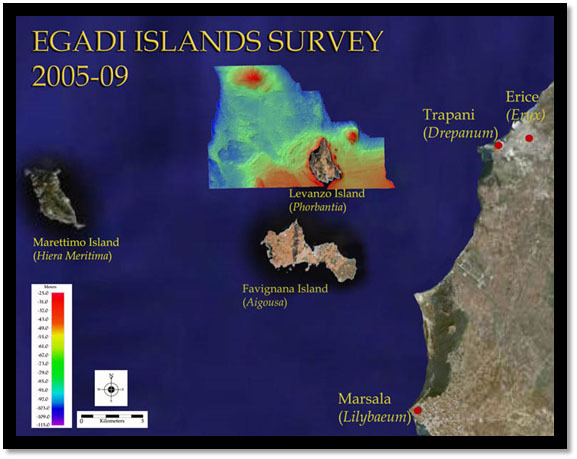 Fieldwork in the 2009 season reaffirmed several conclusions formulated over the past seasons about the survey area and the Levanzo I wreck. The survey area has two basic area groups that have a different history in regards to human intervention: open sand areas and rocky areas. Over the decades, open sand areas have been scrapped flat and laid bare of cultural material, as well as most biological inhabitants. As such, the search in these areas is relatively pointless with visual and most acoustic methods. Furthermore, work in this area that reaches to the 110-m contour indicates that the soft, sandy cover is shallow, somewhere in the nature of 5-20 cm. Such meager sand cover would not have allowed shipwrecks or jetsam to settle to a depth that would protect them from drag nets. It is only in the rocky areas that cultural material could survive as the rocks provide some protection from the drag nets. A case in point being the Levanzo I wreck. However, as with the Levanzo I wreck, this protection is limited to the lowest layer of the cultural deposit, whereas the uppermost layers are subject to drag net hits during the period when fisherman were learning the safe areas of operation. Cultural material deposited in the open sandy areas and caught in drag nets was re-deposited at the edges of the rocky areas when the nets snagged; examples being the Catherine D ram and the Greco-Italic amphoras. In addition to confirming some hypotheses for the Levanzo I wreck, additional information was discovered this season. An examination of collected amphoras from the site confirms a N. African origin, as well as a mixed cargo that reflects the special nature of Carthage as an entrepôt in the central Mediterranean. Amphora types represent areas from the western, central, and eastern Mediterranean. Furthermore, the cargo provides evidence for the nature of annona shipments and the additional cargos loaded by ship owners/operators involved in the annona shipments. The other interesting line of study is the tubi fittili, for their distribution and contributing to the specifics of this technology’s history of dissemination. It is also clear that some of the vessel itself survives, although it is likely poorly preserved and fragmented and would likely only represent the lowest segment of the hull. The methodology employed this season was successful in that much was learned about mapping and excavating with an ROV. Overall, the outcome from the exercise was successful on archaeological standards. The exercise also demonstrated areas for improvement and new technologies that can be applied for such operations. Limitations for the procedures utilized on the Levanzo I site are understood as the site has little depth and virtually no stratigraphy.